Warren Buffett’s iconic letter to shareholders has been published on Berkshire Hathaway's website. The legendary chairman of Berkshire Hathaway has been writing this annual letter for more than 32 years. In it he summarizes the performance of the various businesses that make up the portfolio of his conglomerate. The Oracle of Omaha often gives insight on his decision making process, when making investments. "On the plus side last year, we made purchases totaling $14.5 billion in fixed-income securities issued by Wrigley, Goldman Sachs and General Electric. We very much like these commitments, which carry high current yields that, in themselves, make the investments more than satisfactory. But in each of these three purchases, we also acquired a substantial equity participation as a bonus. To fund these large purchases, I had to sell portions of some holdings that I would have preferred to keep (primarily Johnson & Johnson, Procter & Gamble and ConocoPhillips). However, I have pledged – to you, the rating agencies and myself – to always run Berkshire with more than ample cash. We never want to count on the kindness of strangers in order to meet tomorrow’s obligations. When forced to choose, I will not trade even a night’s sleep for the chance of extra profits." I speculated before that one reason why he might be selling solid dividend stocks such as Johnson & Johnson and Procter and Gamble could be that they haven’t fallen as much as the broader market, which makes them ideal for Buffett to deploy the funds in other beaten down sectors. Another reason could be that he needs to raise as much cash as possible, in order to participate in other preferred stock or fixed income deals, where he could earn a 10%-15% annual dividend yield, with very favorable terms for his company. Ordinary investors do not however have the purchasing power to participate in such favorable deals at this time. Buffett also spend several pages discussing derivatives and shortcomings of the Black Scholes option-pricing model. The big news yesterday was the dividend cut from on of the most prominent dividend aristocrats – General Electric (GE). The company lowered its quarterly payment to $0.10 from $0.31/share for the first time since 1938 in an effort to save 9 billion dollars annually and maintain its AAA rating. After spending billions on stock buybacks when its stock price was high, the company sold billions in equity to investors during 4Q 2008, including a sale of $3 billion in convertible preferred stock to Warren Buffett. There had been rumors that the company would cut the dividend payment for over 4 months; every time a rumor of a dividend cut was spreading, Jeffrey Immelt kept reassuring investors that the payment could be maintained well into 2009. Then as more analysts began digging into the company’s financials, it became widely accepted that GE had to either maintain its dividend or lose its AAA rating. The first sign of trouble came in 2008, when GE reported its 1Q results, which were below the estimates by analysts. The company blamed its poor performance on financial services businesses, which were challenged by a slowing U.S. economy and difficult capital markets. The second sign of trouble came in September, when the company failed to increase its dividends for the first time in 32 years. At the same time the company suspended its $15 billion stock buyback program, announced in December 2007. Just a week after GE announced this, the company sold $3 billion preferred stock to Warren Buffett, yielding 10%. In addition to that the company sold an additional 547.8 million shares for approximately 12.2 billion dollars to shareholders. The CEO kept reassuring investors that everything was ok and that both the AAA rating as well as the dividend could be maintained. The markets didn’t trust him, and GE stock lost almost half of its value in he first two months of 2009. Another note on the CEO is that he kept buying GE stock all the way down. Many investors viewed his acquisitions of 150,000 GE shares on the open market in the first quarter of 2008 as bullish. This goes on to show that investors should treat insider purchases with caution, and not automatically view them as a bullish signal. As a result of the dividend cut, I disposed of my whole GE position during the day. The company no longer fits the dividend growth stock characteristics, for which I bought it in the first place. Despite the fact that I am a buy and hold investor, I realize that I would still have a turnover in my portfolio, even if I select my purchases from elite lists such as the dividend aristocrats, dividend achievers and the dividend champions. I continue seeing a lot of companies increasing dividends in 2009, so I still have a faith in dividend investing. The bear market has brought many stocks to multi-year lows, pushing their current dividend yields to levels not seen for years. Some dividends got cut in the process, triggering further selloffs in stock prices, which somehow miraculously lead to almost the same current dividend yields. Multiplying the most recent quarterly or monthly dividend payments by 4 or 12 and then dividing the result by the amount of the stock price calculates current dividend yield. For example if you purchased Bank of America (BAC) stock in September 2008 at $25.60, while the dividend was $0.64/quarter, the current dividend yield would have been 10%. After BAC cut its dividends by 50% to $0.32/quarter, if the stock was trading at $12.80 then the current dividend yield would have been 10% as well. Most investors who chase high yielding stocks blindly would tell you that in both situations BAC was a high yielding stock to consider. There is one difference however – the person that purchased BAC for $25.60 is worse off after the dividend cut, in comparison to the investor who purchased BAC stock at $12.80, since their dividend income is decreased in half. Astute readers would realize that current yield does not matter much to a long-term dividend investor. What matters is that dividend payments get increased over time. If an investor purchased stock in Bank of America in 2002 at $30/share, their current dividend yield would have been 4%. As Bank of America kept increasing its dividend payments from $0.30 to $0.64, the current yield on Bank of America was almost unchanged around 4%. The yield on cost however, which is calculated by dividing the most recent annual dividend payment to the price that you paid for the shares that you own, has been increasing despite the current yield being unchanged. An investor who purchased 100 shares at $30 in 2002 received $30 every quarter. The current yield and the yield on cost in this scenario were 4%. The amount received increased as the dividend payment was raised to $0.64/quarter in 2007, bringing the yield on cost to 8%. The current yield was almost 5% at the time when the dividend was increased and the stock was trading at $50. When Bank of America cut its dividend payment to $0.32/share current yields were still in the vicinity of 10%. This affected only new investors however, since they were the ones who might generate a 10% annual return on their investment solely from the dividends received, provided that the payment was not cut again. The investor who purchased BAC stock back in 2002 saw their income fall by half, bringing their yield on cost to 4.3%. In hindsight, selling after the first dividend cut and allocating the money into another dividend growth stock, could have been a good thing for the investor who purchased BAC stock in 2002. As we later learned, Bank of America cut its dividend payment per share once again to just one penny per quarter. There are many dividend success stories however, where investor’s yield on cost is in the double or even triple digits. An investment in 3M (MMM) at the end of 1988 at $16 generated a current dividend yield as well as yield on cost of 4%. After 20 years of consistent dividend increases however, the annual dividend payment is increased to $2/share, making for a yield on cost of 12.5%. Check out my analysis of MMM. Even if you purchased into an S&P 500 index fund in the late 1970’s, you would have seen our yield on cost increase from 5.20% to 26.20% currently. I hope I have illustrated a point that high current yield is not what dividend growth investors should be looking at when they search for investment opportunities. The thing that matters is finding a solid non-cyclical company with a wide moat, which could increase its earnings over time. Increase in earnings power could lead to increase in dividends over time. As Dave Van Knapp put it in 10x10, the best dividend strategy is to achieve a balance between dividend growth and initial dividend yield. International Business Machines Corporation (IBM) develops and manufactures information technologies, including computer systems, software, networking systems, storage devices, and microelectronics worldwide. IBM is a major component of the S&P 500, Dow Industrials and the Dividend Achievers Indexes. IBM has been consistently increasing its dividends for 13 consecutive years. From the end of 1998 up until December 2008 this dividend growth stock has delivered a zero annual average total return to its shareholders. 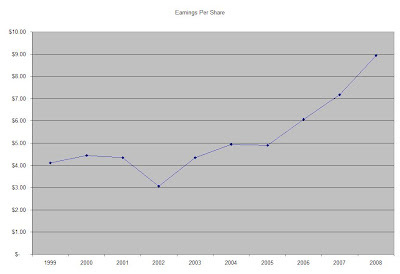 At the same time company has managed to deliver a 9.00% average annual increase in its EPS since 1999. The ROE has remained largely between 25% and 40%, with the exception on 2008. Annual dividend payments have increased by an average of 16.80% annually since 1999, which is much higher than the growth in EPS. A 17% growth in dividends translates into the dividend payment doubling almost every four years. Since 1997 IBM has actually managed to double its dividend payment almost every 5 years. The dividend payout increased slightly for the majority of our study period, by rising from 11% in 1999 to 21% in 2008. A lower payout is always a plus, since it leaves room for consistent dividend growth minimizing the impact of short-term fluctuations in earnings. IBM is not yet attractively valued. The stock trades at a price/earnings multiple of 10.7, and has a low DPR. However the current dividend yield is below the 3% minimum threshold that I have set. As a dividend growth holding IBM is a buy on dips below $67. Big Blue has cut its dividend previously in 1993. Berkshire Hathaway (BRK-A, BRK-B) published a glimpse of its stock portfolio holdings as of December 31,2008, on the SEC website. 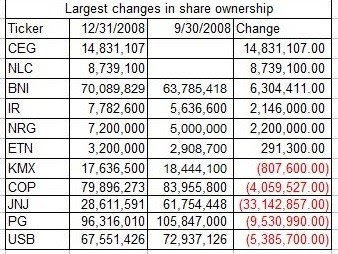 I have highlighted the largest changes in shares owned. In the last quarter of 2008 Warren Buffett kept adding to his Burlington Northern (BNI) position by purchasing well over 6 million shares for Berkshire’s account. He also added to his positions in Ingersoll- Rand (IR), NRG Energy (NRG), and Eaton (ETN). He initiated positions in Constellation Energy Group (CEG) using his Midamerican subsidiary and in Nalco (NLC). Buffett was not only buying American however. He was selling as well. Berkshire cut its stake in Johnson & Johnson (JNJ) by half to 28 million shares. Other notable decreases included Procter & Gamble (PG), US Bancorp (USB), Conoco-Phillips (COP) and Carmax (KMX). Berkshire also disposed of all of its Anheuser-Busch stock, which was tendered at $70/share after the merger with InBev. The holdings in other financial stocks such as Wells Fargo (WFC), American Express (AXP), Moody's (MCO) and Bank of America (BAC) were mainly unchanged for the quarter. The value of Berkshire’s portfolio dropped to $51.87 billion from $69.89 billion at the end of third quarter 2008. Even the Oracle of Omaha is not immune to market corrections, especially now that his asset base is so huge. Berkshire Hathaway shares dropped by 26% in the last quarter of 2008, compared with a 21.5% drop for the broad S&P 500 index. So far this year both S&P 500 and Berkshire Hathaway stock are down between 12.20% and 13% each respectively. Given the changes in Berkshire Hathaway’s portfolio, I would not recommend acting similarly in your personal investments, based solely on following Buffett’s moves. One reason why he might be selling solid dividend stocks such as Johnson & Johnson and Procter and Gamble could be that they haven’t fallen as much as the broader market, which makes them ideal for Buffett to deploy the funds in other beaten down sectors. Another reason could be that he needs to raise as much cash as possible, in order to participate in other preferred stock or fixed income deals, where he could earn a 10%- 15% annual dividend yield, with very favorable terms for his company. Ordinary investors do not however have the purchasing power to participate in such favorable deals at this time. His list of fixed income or preferred stock investments range from Goldman Sachs, General Electric, USG, Swiss Re, Harley Davidson and Tiffany’s. As a dividend growth investor, I still consider Procter & Gamble and Johnson & Johnson one of the essential holdings in my dividend stock portfolio. Warren Buffett is not always right when it comes to selling. He did sell his stake at McDonald's (MCD) in 1998. In his 1998 Letter to Shareholders he mentioned that "In particular, my decision to sell McDonald's was a very big mistake.Overall, you would have been better off last year if I had regularly snuck off to the movies during market hours." Microsoft Corporation provides software products for computing devices worldwide. Microsoft is a major component of the S&P 500, Dow Industrials and Nasdaq 100 indexes. Microsoft has been consistently increasing its dividends since 2003. From the end of 1998 up until December 2008 this dividend growth stock has delivered a negative annual average total return of 3.90 % to its shareholders. At the same time company has managed to deliver a 11.30% average annual increase in its EPS since 1999. The ROE has decreased from a high in 1999 at 36% to 12% in 2003, before recovering strongly to over 50% in 2008. After a long history of technological innovation, Microsoft showed signs of maturing as a company when it initiated a dividend policy in 2003. Annual dividend payments have increased by an average of 41.60% annually since 2003, which is much higher than the growth in EPS. The past three years have shown annual increases of 12,11 and 15% respectively. I would expect MSFT to increase its dividends by 10% over the next five years, until it reaches a dividend achiever status. An 10% growth in dividends translates into the dividend payment doubling almost every seven years. Since 2003 MSFT has actually managed to increase its dividend payment over five times. The dividend payout has remained below 30% for the majority of our study period. A lower payout is always a plus, since it leaves room for consistent dividend growth minimizing the impact of short-term fluctuations in earnings. I think that MSFT is attractively valued with its low price/earnings multiple of 9.5, and a low DPR. However the current dividend yield is below the 3% minimum threshold that I have set. Another threshold would be to wait and see if MSFT could actually achieve a dividend achiever status. As a value holding MSFT is a buy on dips below $17. As a dividend growth stock, it might take several years to fully mature. Once it does however, MSFT will probably be the premiere tech holding for dedicated dividend investors. During the 1982-2000 secular bull market, investors were looking for quick capital gains in hot growth sectors. Dividend stocks were viewed as something that is appealing to older investors. As stock prices rose to the stratosphere dividend yields on the S&P 500 fell to as low as 1%, which left long-term investors with a smaller cushion against market declines. With the 2003 lowering of taxation on dividends, income-producing companies have been in vogue with investors. There are many reasons why dividend stocks are superior to non-dividend stocks. One reason is that most stocks rise and fall on average at the same pace as the market. Stocks that pay dividends however, offer an extra incentive to hold on to them during tough times. Another reason to hold on is that most dividend stocks represent mature companies with stable business models that generate much more in earnings than what could be re-invested back into in the business. Slower growth companies will generally experience much lower drops in share prices in comparison to hot growth sectors. Furthermore the quarterly dividend payment will provide investors with a relatively safe cushion against bear market declines, as most companies keep sending their dividend checks monthly or quarterly to shareholders. During market declines it is very tough to generate any capital gains. The dividend is the only item that increases investors total returns during severe corrections. Most corporations that pay a portion of their profits to investors prove that earnings are real, and not a result of the manipulation of GAAP rules. More important is the fact that once management has set a dividend policy of a stable or a rising dividend payment, only an unforeseen event or a major fiasco in the company’s business model will derail that commitment. Unlike share buybacks, which could be canceled quietly, a dividend cut or suspension will most likely anger stockholders. When a company commits to paying a dividend, management is much more careful with approving projects that might not yield a sufficient return on investment. Most investors have heard the headlines in 2008, which included major dividend cuts from companies such as Bank of America, Citigroup and a plethora of other financial stocks. The majority of dividend cuts however, have been concentrated in the financial sector. Even during recessions, most corporations keep their dividends either unchanged or slightly higher. The current recession is no exception so far. Even during bear markets, dividends have a much lower volatility in comparison to stock prices. Even in 2008, despite the financial crisis, dividend payers in the S&P 500 still managed to outperform non-dividend payers, according to Standard & Poors. The same was true for 2007 as well as for 2006. Investors can gain an even more profitable edge by focusing on dividend growth investing. There are several recession resistant dividend stocks, which should be the cornerstone of any dividend growth portfolio, provided that they are accumulated at bargain prices. PepsiCo (PEP) – This consumer staple has been increasing its dividends for 36 consecutive years. Over the past decade PEP has managed to almost triple its EPS and deliver a total dividend growth of 227%. The maker of Pepsi Cola and Frito-Lay chips is currently yielding 3.40%. Investors who were lucky enough to purchase this dividend aristocrat 20 years ago at $6.50 are currently generating a 26% yield on the cost of their original purchase. I expect PEP to keep delivering by increasing its dividend in May, as it has been doing for the past several years. Check out my analysis of Pepsi. Johnson & Johnson (JNJ) is another consumer staple whose product sales are less likely to suffer during recessionary times. This dividend aristocrat has been rewarding shareholders for 46 years with increasing dividends. Over the past decade EPS have grown from $1.47 to $4.57, while dividends have risen by 229%. Investors who purchased JNJ stock 20 years ago are now earning a respectable yield on cost of 34%. Johnson & Johnson currently yields 3.20%. Check out my analysis of Johnson & Johnson. Procter & Gamble (PG) focuses on brand products in over 180 countries worldwide, by focusing on three major business segments – Beauty and Health, household Care and Gillette. P&G is another consumer staple whose products consumers can’t live without and which they use even during tough times. PG has had a slower dividend growth of 180% over the past decade, while its EPS increased from $1.30 to $3.64 over the same period. PG currently spots a modest dividend yield of 3.10%. Investors who ignore it and focus on the current highest yielding stocks should be reminded that a long-term investment in PG 20 years ago would be yielding almost 30% on cost. Check out my analysis of Procter & Gamble. Mcdonald’s (MCD), which is the largest fast food restaurant operator in the world, has been somewhat immune from the financial crisis, as it keeps posting solid increases in its same store sales. I especially like the fact that the company always seems to unveil new innovative items on its menu, which consumers can’t get enough of. As a result its earnings per share have almost tripled over the past decade from $1.39 to $3.76, while dividends increased almost 10 times. Long-term shareholders of MCD who purchased stock 20 years ago have seen their yield on cost rise to 34% over the course of their investment. The dividend payout for the golden arches also looks conservative, which increases the chances that the company will continue its uninterrupted streak of 32 consecutive annual dividend increases. Check out my analysis of McDonald's. Kimberly Clark (KMB) is a slower growing dividend aristocrat, which has nevertheless raised its dividends for 36 years in a row. The slower growth helps explain its high current yield at 4.70%. While revenues and earnings per share have increased over the past decade, the overall net income that KMB has generated has remained stagnant. Dividend payments on the other hand have more than doubled over the same period, which has increased the payout ratio to slightly above 50%. An investment in KMB 20 years ago would be yielding close to 16% on cost. Check out my analysis of Kimberly Clark.